Flyers, brochures, full color posters, newsletters and more! Trek Imaging allows our customers to keep their message bright and lively! Whether you are getting ready for a trade show or need that mass marketing piece printed, addressed and mailed out, Trek Imaging is your local partner. Our digital Indigo Press offers the highest quality and most economical way of getting your printed pieces delivered with lightening fast speed and accuracy! Our graphic design staff can assist you with file conversion to helping develop that home run marketing flyer. We have the latest and greatest in digital copiers and our production staff is second to none in pre-flight and assembly. Call Trek Imaging today! Our designers can support both the mechanical and creative aspects of your project. We can work with virtually any software application, and our systems are compatible with both Macs and PCs. Our state-of-the-art proofing system enables us to produce proofs and samples on demand. To ensure the quality you expect, we constantly update our high-quality machinery to stay ahead of the pack. From small, single-color presses to full-color web presses, we place your job on the equipment that best fits the job at hand. 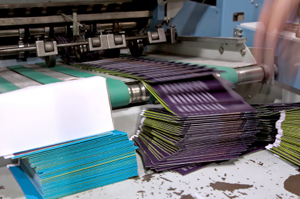 Our commercial printing services include: brochures, booklets, pamphlets, presentation folders, point-of-purchase displays, catalogs and magazines, perfect bound and case bound books, business forms, CD inserts, sleeves and inlays. We really can do it all. Trek Imaging has the the expertise in printing, finishing and distribution to help our customers get the very best in standees, counter cards, posters, mobiles, counter mats, static clings, foam core, and any other product your company needs to get in touch with your customers.